Jumper - Christmas time is the perfect excuse to make your boyfriend wear cute knitted jumpers. The shops are full of them at the minute, in every colour and design possible, but this is definitely one of my favourites. Wallet - I always find that a daft wallet is a great present, especially as you can slip a cheeky £10 note or a gift card into the wallet as an extra surprise for when they open it. Watch - This is the most expensive gift in this selection, but still at only £50 it's quite affordable. If it's a little too much, they are also available in black for much cheaper. Nandos Sauce - This huge bottle of Nando's sauce is the ideal gimmick Christmas present because it's useful, and will most likely last all year. PJ Bottoms - My boyfriend always expects PJ's for Christmas... and I always seem to go for the brightest silliest ones I can find. This pair are covered in pictures of American junk food - I'd totally wear these too! Aftershave Vivabox - I blogged about this, and I still think it's one of the best presents you can buy someone. It gives them the chance to sample seven different scents, and choose which one they like the best to receive in full size. Personal Planner - Like a Filofax, but more personal. You can get these printed with your own photos on the front and back covers and put special messages or personalised info inside. Washbag - These will always come in useful for men, it's not just girls who need a makeup bag! He'll be able to use this day to day or if he goes away on holiday or to take to uni or the gym. I'd slip a couple of bottles of his favourite shower gel or shaving foam in here too. Converse - What boy doesn't want converse? And if he's already got this colour, theres plenty more to choose from! Hat - Much like a wooly jumper, I like a boy in a wooly hat! This one is so cool, and it will keep him all snuggly and warm while you're out playing in the snow. Holdall Bag - Wether he wants to use the bag for uni, work or the gym, this bag is really smart and versatile. I love the colour, and it will look great with whatever he chooses to wear each day. 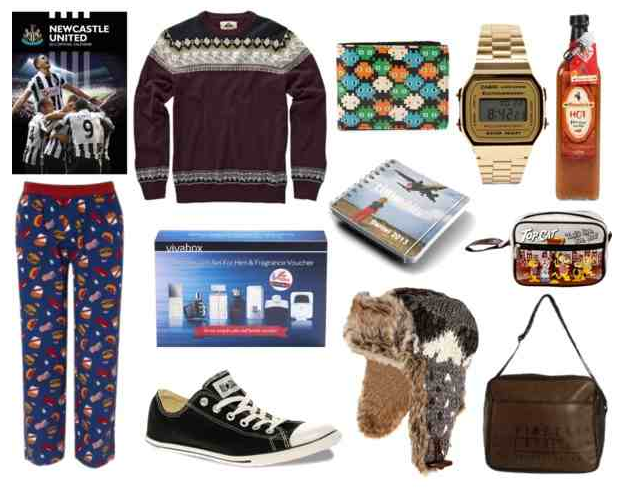 You can find my gift guide for your best friend here, I still have girlfriend, Mum, Dad & Secret Santa to come. I love your gift guides, really helpful!